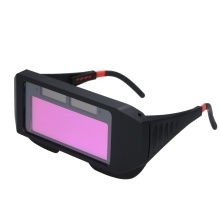 This auto darkening welding goggle features anti-ultraviolet, infrared radiation, anti-glare. The auto-darkening filter automatically changes from a light state to a dark state when an arc is struck, and returns to normal light state when welding stops. Wided applied in gas welding, steel welding, cutting, welding and so on. Anti-ultraviolet, infrared radiation, anti-glare, do not stick slag. Mirror with scratch-proof coating that avoids scratching. Legs with ventilation part made of ABS are solid and adjustable. Nose bridge frame made of soft rubber, stable and comfortable. Lens is anti-impact, can be automatically changed to light filter. With solar charging function, and automatic ON / OFF function, low power consumption. Easy and safety to operate, light weight and convenient. Suitable for protecting eyes while doing the welding work. 2. Please allow 5-20mm differences due to manual measurement.